Oct. 24, 2018 – A 100 per cent First Nations owned and operated company based in Thunder Bay, Ont. has received province-wide recognition. It was officially announced on Thursday, Oct. 18, 2018 that the Agoke Development Corporation (Agoke) was the recipient of the Business Partnership of the Year Award at the NADF Business Awards. The forestry enterprise owned by Aroland, Eabametoong and Marten Falls manages the Ogoki Forest, oversees forest access road maintenance and silviculture programs while protecting culturally sensitive areas and animal habitat. 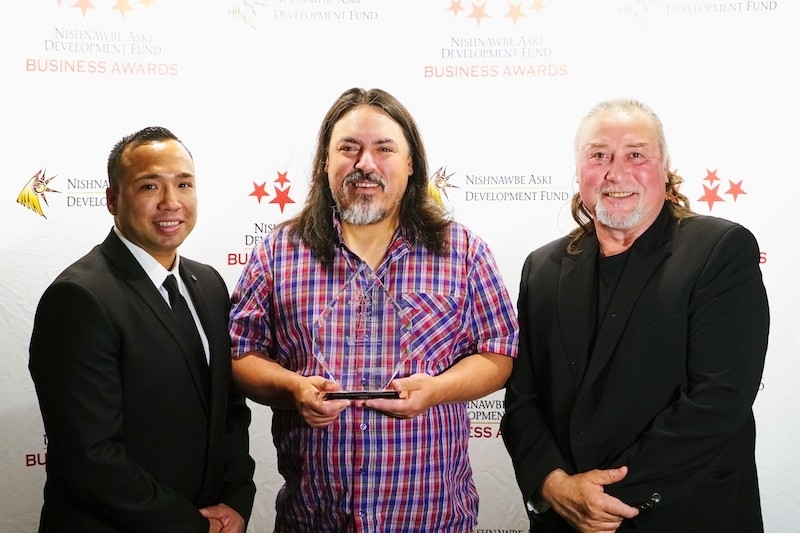 This marks the 28th year of the NADF Business Awards – Canada’s longest running Aboriginal Business Awards program that celebrates the best of the best in Aboriginal Business. Seven award recipients were recognized for their achievements and contributions to local and regional economies at a gala dinner at the Senator Hotel in Timmins, Ont. The Agoke Development Corporation started in 2015 with the intent to build capacity in forest management and to maximize economic opportunities in the forestry sector. The three First Nations that own the corporation haven’t seen much opportunity come their way in the past. That same year, the three First Nations signed a co-operation agreement and established the Agoke Development Corporation to take on the business development on behalf of the three First Nations, a decision which has paid off in a major way. In March 2018, Agoke made headlines when it announced a forestry agreement with the Ministry of Natural Resources and Forestry to take over management responsibilities of the crown unit. Now, for the first time, the three First Nations have a say on what goes on in the Ogoki forest and are building forestry knowledge to further their role as stewards of the land. Agoke is driving the process and has secured the forest resource license to harvest wood, assign harvest blocks, complete compliance and monitoring of woodland operations, prepare annual work schedules and reports. Agoke is also involved in developing the next 10-year forest management plan for 2020-2030. Over the past three years, Agoke has also successfully managed and administered the provincial road funding and advocated for a new $600,000 pilot project for bridge and road repairs to mitigate barriers to wood fibre for existing and new markets. Agoke is the only First Nation-owned management entity in Ontario to manage the province’s road money for forests and is striving to include their community members in numerous aspects of forestry. Working well with others has also proven to be a valued and necessary means of doing business. That’s certainly reflected in the fact Agoke is being recognized for the way it works with others. “It really shows the importance of collaboration and a common vision of partnerships,” stated Bill Spade, Agoke director, Eabametoong First Nation. Agoke took the time to build key relationships with consuming mills in the region and their efforts were successful in establishing a joint-venture agreement with the Nakina Sawmill to restart the operations, which have been dormant for over a decade. “That’s very special to us,” Spade said of the deal, which saw first-right-of-refusal for road building, log harvesting and delivery contracts. The Agoke Board set up a working committee that provides input into the facility’s hiring process, developing special programs for employment and training, and are targeting 75 per cent Aboriginal employment in the sawmill. Over the next few years, Agoke is looking to expand into biomass and biofuel opportunities to help scale capacity for micro-grids in the Far North. “We understand there are pilot projects with solar and other types of renewable energy options. We would like to see our remote First Nations reduce diesel as an energy source,” said Delia Okees, Agoke director, Marten Falls First Nation. “With technological advancements being made, there is a huge opportunity to be innovators in renewable energy for combined heat and power in northern Ontario. There is a lot of work to do, but we believe we are on the right track, and we don’t plan on slowing down anytime soon,” Okees added.